Nanoparticle Tracking Analysis (NTA) is a technique for sizing nanoparticles (such as vesicles) in solution. Size is estimated based upon Brownian Motion (more than you’ll ever want to know about that here). In summary, as light excites small particles, their size can be estimated based on their motion. NTA takes short videos of small particles under magnification following excitation with a laser. These videos are analyzed by software that tracks the motion of individual small particles and creates a histogram of particle sizes in a sample. Concentration can also be estimated using this technique based on known volume of sample in the anlysis chamber. Low sensitivity fluorescence is not generally suitable for extremely small number of molecules present on vesicles. 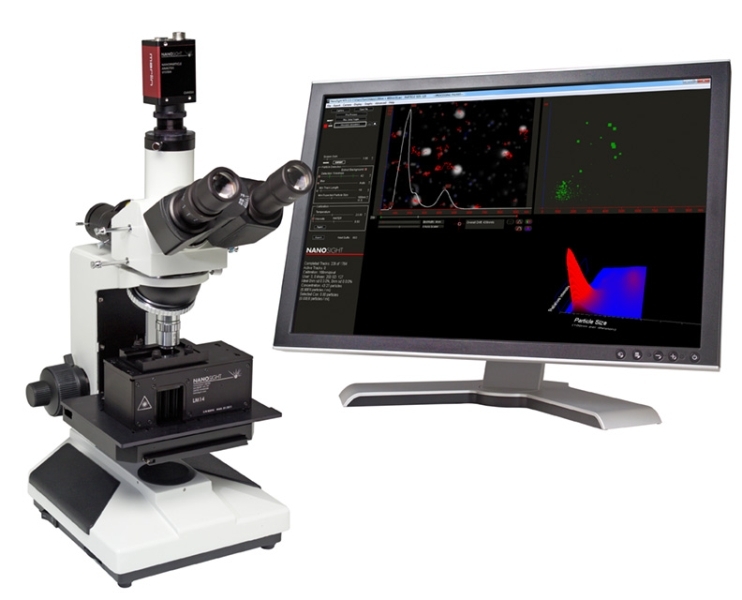 NanoSight™ LM-10 (Malvern) equipped with a 532 nm laser, sCMOS camera and a syringe pump. Samples to be analyzed via NTA must be reasonably pure isolations of vesicles of interest. Using syringe pump, introduce a new volume of sample into the field of view between each acquisition. Acquisition settings we generally use: camera level 16, detection threshold 6, with maximum jump length, blur, and min track length all set to Auto. Analyze data using NanoSight software (version 3.2).